"poems that are truly memorable, full of sorrow yet open to redemption and beauty." Nostalgia—the sweet sadness of memory. That describes the tone of most of Ron Rash’s Poems: New and Selected as well as his award winning fiction. Much like an old lyrical ballad, he sings to the land, the waters, and the people of his place in the South. The poems are a kind of prayer of loss and going on, much like Stephen Collin Fosters’ ballad “Hard Times, Come Again No More.” Most are narrative or dramatic monologues delivered in a vivid yet plain voice with a fine sense of timing. Rather than imposing themes, he finds meaning in the stories of the people and land in these narrative and lyrical poems. hit four houses if he had the wind. you’d know, whether or not you wanted to. Among the Believers (2000) takes us into the evangelical world of his people. Here the author turns to the water as symbol of life and death. the other half green with leaves. the river red as a wound. Such historical poems speak of the acts of common folk in vivid yet mythic terms. Perhaps the strongest book, Raising the Dead (2002) opens with the powerful portraits of those suffering displacement as a result of the power company’s deliberate flooding of Jocassee Valley, South Carolina. Here water is considered death and loss as the citizens watched their homes and land taken from them. As critic Tim Peeler says, “Rash closes a poem as well as anyone writing today. As a result, the ghosts in these poems, of the Jocassee Valley and its aqua-burial and of the revisited ancestors and historical figures will haunt the reader beyond the pages of the book.” The singular beauty of such poems as “Shelton Laurel” is achieved through a brother’s letter to his sister. whose eyes are blind from years of too much dark. beside a stream bank deep in Shelton Laurel. A favorite poem is “At Reid Hartley’s Junkyard” in which the author tells of taking his aunt to visit the wrecked car in which her son died. her right foot pressed to the brake. 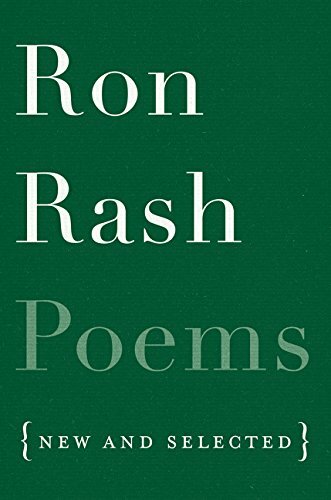 In concrete images drawn through memory’s stream, Ron Rash writes poems that are truly memorable, full of sorrow yet open to redemption and beauty.